Charles Moscowitz: Is the Boston Marathon bomber a Frank Amendment Terrorist? Is the Boston Marathon bomber a Frank Amendment Terrorist? I DID NOT WANT TO GET INTO THIS TODAY, A DAY IN WHICH MY FELLOW BOSTONIAN S HAVE BEEN MURDERED AND ARE SUFFERING TERRIBLE INJURIES FROM THE TERRORIST BOMBING OF THE BOSTON MARATHON, BUT I AM COMPELLED TO DO SO BY THE REMARKS OF THE DISGRACED FORMER MASSACHUSETTS CONGRESSMAN BARNEY FRANK. RESPONDING TO THE ATTACK, FRANK TOLD MSNBC THAT TAXES WEREN'T HIGH ENOUGH AND THAT REPUBLICANS HAVE SOMETHING AGAINST PUBLIC SECTOR EMPLOYEES. FRANK SPONSORED A BILL THAT STRUCK DOWN THE EXCLUSION CLAUSE FROM THE IMMIGRATION AND NATIONALITY ACT IN 1989. HE DID THIS TO HELP LEFT-WING POET GABRIEL GARCIA MARQUEZ, THE AUTHOR OF “MY MELANCHOLY WHORES,” WHO HAD BEEN DENIED A VISA BY THE STATE DEPARTMENT BECAUSE OF HIS TIES TO FIDEL CASTRO, TO ENTER THE COUNTRY SO HE COULD SELL BOOKS TO ELITIST LEFT-WING COLLEGE STUDENTS. AS A MEMBER OF CONGRESS, FRANK COULD HAVE SPONSORED MARQUEZ TRIP BUT INSTEAD HE SPONSORED A LAW THAT MADE IT POSSIBLE FOR ALL VISA APPLICANTS TO ENTER THE COUNTRY LEGALLY UNLESS THERE WAS “PROOF” THEY HAD BEEN INVOLVED IN “TERRORIST ACTIVITIES” A STANDARD THAT WOULD BE VIRTUALLY IMPOSSIBLE FOR OUR IMMIGRATION AND EMBASSY OFFICIALS TO PROVE. 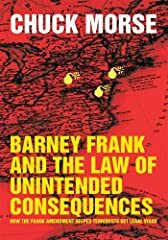 GERALD POSNER, IN HIS BOOK “WHY AMERICA SLEPT" WROTE: THAT FRANK HAD “LED A SUCCESSFUL EFFORT TO AMEND THE IMMIGRATION AND NATIONALITY ACT SO THAT MEMBERSHIP IN A TERRORIST GROUP WAS NO LONGER SUFFICIENT TO DENY A VISA....UNDER FRANK’S AMENDMENT, WHICH SEEMS UNTHINKABLE POST–SEPT. 11, A VISA COULD ONLY BE DENIED IF THE GOVERNMENT COULD PROVE THAT THE APPLICANT HAD COMMITTED AN ACT OF TERRORISM.” FORMER CIA DIRECTORS JAMES WOOLSEY AND GEORGE TENET CLAIMED THAT CONGRESS HAD OPENED THE FLOODGATES TO TERRORISTS. AFTER THE PASSAGE OF OVER A DOZEN SEPARATE FRANK AMENDMENTS, TERRORISTS FLOODED INTO THE COUNTRY WITH LEGAL VISAS INCLUDING THE 19 SEPTEMBER 11TH HIJACKERS ACCORDING TO THE CONGRESSIONAL TESTIMONY OF TERRORISM EXPERT STEVEN EMERSON. THE SEPT. 11 COMMISSION REPORT (PAGE 237) STATES THAT “THE MUSCLE HIJACKERS BEGAN ARRIVING IN THE UNITED STATES IN LATE APRIL 2001. IN MOST CASES THEY TRAVELED IN PAIRS ON TOURIST VISAS AND ENTERED THE UNITED STATES IN ORLANDO OR MIAMI, FLORIDA; WASHINGTON, D.C.; OR NEW YORK. INTERNATIONAL LAW AND CUSTOM HAS ALWAYS RECOGNIZED THE NATURAL RIGHT OF THE SOVEREIGN NATION TO DENY A VISA TO A SUSPECTED FOREIGN ENEMY. AMERICA TRADITIONALLY DENIED VISAS TO FORMER NAZIS, RACISTS, ANTI-SEMITES AND OTHERS ESPOUSING IDEOLOGIES THAT RUN CONTRARY TO AMERICAN VALUES. FRANK THOUGHT IT WAS PROGRESSIVE TO REMOVE THAT RIGHT, A RIGHT THAT IS AS FUNDAMENTAL AS THE RIGHT OF AN INDIVIDUAL OR OF A FAMILY TO DENY ENTRANCE TO A PERSON INTO THEIR PRIVATE HOME. IT IS DIFFICULT TO FATHOM THE DAMAGE THE FRANK AMENDMENT DID TO OUR SECURITY AND IT'S HARD TO COMPREHEND THE UTTER STUPIDITY OF FRANK'S ADVOCACY. FRANK LEFT THIS COUNTRY VULNERABLE TO ENEMY ATTACK. WHILE MOST OF THE FRANK LEGISLATION WAS DONE AWAY WITH AFTER THE CATASTROPHE OF 9/11, THE QUESTION REMAINS IN TERMS OF HOW MUCH OF IT IS STILL IN EFFECT. ARE OUR IMMIGRATION OFFICIALS STILL AFRAID TO DENY A VISA FOR FEAR OF BEING ACCUSED OF DISCRIMINATION? WILL IT TURN OUT TO BE THE CASE THAT THE BOSTON MARATHON BOMBERS HAD LEGAL VISAS? WERE THEY FRANK AMENDMENT TERRORISTS? TIME WILL TELL. tough to argue with you (not that I pегѕonallу woulԁ want to…ΗaΗa). yeаrs. Wonderful stuff, just ωondеrful!